Truro City manager Steve Tully says he and the club "can look ahead" now that their ground share with Torquay United has been confirmed for 2016-17. Having sold their Treyew Road ground to developers, the club had hoped to have a new stadium by next season. "I think it's a great thing. Everyone knows where they stand now," Tully told BBC Radio Cornwall. "It gives me and Wayne (Carlisle) a great chance to sign players on the back of that. We can look ahead." 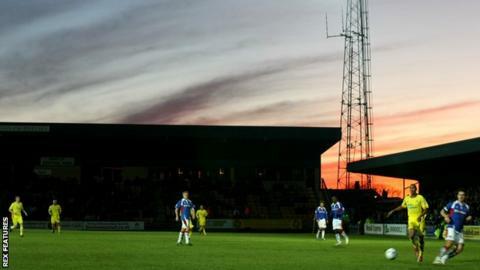 The move gives the team a 172-mile round trip to home games, but represents good business for Torquay United who are struggling financially. "If we are there for one season, great, because then we'll move into our new ground and everyone will be happy again," said Tully. "The chairman's done brilliantly because he's let us know early, and there's no question of where we'll be. We look forward to playing there." City, who are currently ninth in National League South, face 14th-placed Eastbourne Borough at home on Saturday. Tully continued: "They're a very stubborn team and they don't give much away. Our back four or five have to be ready because they've scored a lot of goals, but we'll come up with a plan and we'll be ready. "We've taken Cameron Gill from Exeter - he's a 19-year-old centre forward who's scored a lot of goals in his career so far and we're hoping he'll do the same for us. "He'll be in the squad and he'll definitely get some minutes on the pitch."